Ladies Black Thermal Footless Tights Soft Brushed Inner Winter 140 Denier FleeceLadies Thermal Tights, Black, Super Soft140 DenierBlack pair of Ladies Super soft tights, comfortable & very snug fitting that are soft and warm! 140 Denier. Ladies Thermal Tights, Black, Super Soft. Black pair of Ladies Super soft tights, comfortable & very snug fitting that are soft and warm! Marks and Spencer Hosiery Thermal Heatgen Plus 180 Denier Brushed Footless Tights. 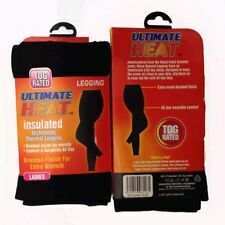 Thermal Heatgen Plus 180 Denier Brushed Footless Tights. Product Style: Footless tights. Worth £30.00. RRP £15.00 Per Pair. Ladies Black Thermal Footless Tights Soft Brushed Inner Winter 140 Denier FleeceLadies Thermal Tights, Black, Super Soft140 DenierBlack pair of Ladies Super soft tights, comfortable & very snug fitting that are soft and warm! Have high performance insulation against cold & maximise the amount of warm air held close to the skinImproved fit and comfort gusset, perfect for every day wear. Thermal Legging. Comfy and cosy Thermal Leggings which are 200 Denier, so nice and thick to keep you snug and warm during the colder weather. These beautiful leggings will surprise, they are made from tenik fibre a warm and soft fibre where comfort is key. (Small diamond lace pattern. I have tried to describe as best and honestly as I can. Clothes: Any clothing new or used, labels will be snipped. Black instead of white, big instead of small etc). Silky Cosy Thermal Fleece LEGGINGS 200 Denier. Colour: Black. 5% Spandex. 95% Polyester. Size: Large. Product: Winter Footless Tight. Colour: Black. Quantity: 2 Pair of tights. Improved Brushed for Warmth and Comfort. Colours may very slightly due to the differences between monitors and other conditions. Super thick, soft and warm Atmosphere thermal full-length footless tights/leggings. Perfect for layering, great for the colder months. Excellent condition, hardly worn. Pictures show outside and velvety fleece-lined inside. Size small (would suit a size 8 to 10). Andrea Bucci Fleece Lined Thermal Black Leggings Size Large Bnip. 200 den. NEW LADIES BLACK THERMAL FOOTLESS TIGHTS HEAT TRAPPER TIGHTS BLACK WARM WINTER Brushed inner layer traps warm air close to your skin 95% polyester 5% spandex provides an incredibly close fit Compression to aid blood flow and support the muscles Side seam free Breathable Amazing 4 way stretch fabric Fit like a second skin – no baggy bits Comfort, hygiene gusset High waist band that stays in place Grip support at ankle to stop the leggings moving up your leg Tog rating of 2.08per cm Machine washable (inside out on a silk setting, 30 degrees – treat as a delicate). 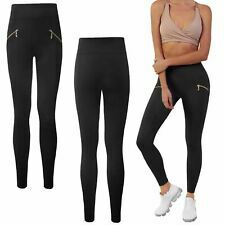 Silky Cosy Thermal Fleece Footless LEGGINGS 200 Denier BLACK Size MEDIUM 36"-42"
Silky Cosy Thermal Fleece Footless LEGGINGS 200 Denier. 5% Spandex. 95% Polyester. Colour: Black. Hip: 92-107cm.